The Los Angeles Rams continue to look at edge rushers in the 2019 NFL Draft. The Rams have shown an ability to draft and develop prospects under veterans on short deals. Malik Reed of Nevada would be a solid addition to the team. He has some versatility and traits that make him an enticing player. Reed met with the Rams for a top 30 visit on March 19. 2018: 77 tackles, 51 solo, 15.5 for loss, 8 sacks, 2 fumble recoveries, 4 forced fumbles. Career: 203 tackles, 134 solo, 38.5 for loss, 22 sacks, 2 pass deflections, 2 fumble recoveries, 11 forced fumbles. Honors: 1st team All-Mountain West (2018), Team Captain (2018), 1st team All-Mountain West (2017), All-Mountain West Academic Honors (2017), Nevada’s Hustle Award (2017), 2nd team All-Mountain West (2016), Outstanding Defensive Player Award (2016), Defensive Full Speed Effort Award (2016), All-Mountain West Academic Honors (2015). Reed has a great first step. He is able to bend the edge in order to get to the quarterback. Reed is a workhorse and plays with a ton of effort. He makes a lot of plays happen due to his second effort. He takes solid angles in pursuit of the ball. Reed shows good instincts as well. His quickness almost always initiates first contact. He can be used as a movement piece in multiple fronts. Reed played with his hand in the dirt for three years before playing more off-ball linebacker his senior year. He has the ability to drop into coverage, although he is inexperienced in that area. Reed does a good job of using speed to set up rush moves. He shows an ability to form a rush plan. Already uses a spin and rip move in his arsenal. 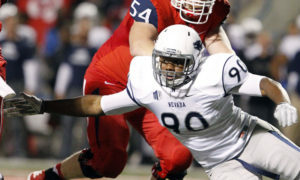 Reed is not an elite athlete minus his three-cone time of 6.89 seconds during his Nevada Pro Day. He needs to be used as a movement piece since his frame is not built for a full-time starter at this time. Weight listed anywhere from 234 to 250 pounds. Reed has some pass rush moves in his repertoire, but he needs to greatly improve his hand usage when fighting off blockers. Also, he will likely struggle in the NFL against the run due to his frame if he can’t bulk up. Reed might not ever be a full-time starter in the NFL. He does have versatility as an off-ball linebacker in the middle and outside, but it is not his best fit. Although Reed is a limited athlete, his three-cone timing will entice teams. His tape does back his impressive timing. He is a quick twitch athlete that will beat offensive linemen off the snap. His pass rush moves will allow him to have some success as a pass rusher if he improves his hand usage. He will struggle against the run, however, he is not afraid to stick his nose in for tackles. Versatility in coverage, pass rush and experience as an off-ball linebacker allows a team to move him around to give him good matchups. Reed should be a fourth or fifth round prospect. I think he has value. If he can put on some weight and get stronger without losing anything in his bend, he could develop into a starter down the road. When looking for pass rushers, this class is extremely deep and robust in that aspect. There is a dynamic top and even dynamic depth. Day 3, at EDGE specifically, you look for those gems that can turn into good football players. Malik Reed is one of those players that many draftniks are on after his fantastic week at the NFLPA game. Reed sat down with Behind the Steel Curtain to give us an in-depth view of the player he is and what type of player the Steelers will be getting if they draft him. Nick: You recently competed at the NFLPA game and you were a huge standout. How was that experience? MR: It was a great experience. I was competing against some of the best players nation. To have that opportunity was incredible. I also learnt a ton from the coaches there who have been doing this stuff for a long time. I retained information I was taught there and I’m going forward with it. Nick: You met with 16 teams at the NFLPA bowl, what do you hope you left them? MR: I hope they got an understanding of who I was. Scouts asked me in depth questions about what type of person and player I was and I wanted to relay myself accurately to them. I wanted to show a guy who will be a team player and boost a team. I really wanted them to see that I had the ability to work hard and improve each and every day. Nick: As a DE who turned into an OLB this year, how do you think those are different? MR: It depends on the scheme. I was usually on the edge. As a DE it is more reactionary, it is all in your face. You can see everything better. Being an OLB, if you walk down the ball it isn’t that different aside from using more bend around the edge. Being off ball was the biggest challenge. I had to read the stances and process things longer. Learning coverage was also a challenge. I never had to move in space like that and cover these guys, but I got better at it throughout the season. As I did it, I felt like I did a good job. Nick: If a team asked you to play a hybrid role with OBL in it, what would you say to that? MR: I am welcome to whatever the coaches want me to do. If that means playing at a spot that I am less comfortable at, so be it. No matter how small the role, I want to play and I’ll do what I can to make an impact and I’ll be willing to sit, learn, and go out there to execute. Nick: You have an insane first step. What goes into having that fantastic break off the ball? MR: The weight room and the football field meet there. I worked on my explosion and quickness and not being satisfied with where I am. You always have to improve even your strengths and I focus on explosiveness and quickness a lot. I also try to improve with timing snaps and reading stances so I can play that fast. Nick: With leverage and your hands, you use it well. Your hands are violent, explain how you use your hands on every play? MR: It is a combat of going one-on-one with an Offensive Lineman. The coaches have told me you have to be great with your hands in order to be great. You know, you see elite pass rusher and they are great with their hands. Every guy you go up against is different and you have to watch the tape for tendencies. You are gonna have to defeat him with counters and see where he is trying to strike. I have to be quicker and shrug him off. So, the more moves I have, the better. Nick: Bend was apparent in your game. How did you develop such amazing bend? MR: After doing drills like the hoop drill and from going at the passer at DE, the bend was naturally already there. I kept working the same things and I did it on my own to keep it sharp. Beating tackles and bending, that’s half the battle, and I’m looking to really get to the QB. I want to finish the job, not just pressure him. Nick: At your pro day, what do you wanna show scouts? MR: I want to show them I can run, move well in space, jump well, and show that I can move at OLB. I want all that athletic testing to really be solid. But most importantly, I want to be clean in my drops and answer all questions about my coverage ability. Nick: Where are you most comfortable at right now, DE or OLB? MR: I am comfortable with either. I have gotten snaps all around, but from feedback I have received, the NFL sees me as a SAM 4-3 ILB that can rush the passer, but can drop back in coverage as well. I have a ton of experience working against lineman obviously. That’s why I feel comfortable rushing the passer, but I feel like I can drop into coverage as well. Besides, the more versatile you are, the more valuable you are. So I’m working hard on it all. Nick: What is the biggest part of your game you’re working on? MR: Coverage for sure. I need to be more comfortable with my drops and moving in space. Understanding zones and reading the QBs eyes is still coming to me. Nick: If a team drafts Malik Reed, what type of player will they be getting? MR: They are going to get somebody that is ready to play and a guy that is ready to work. I want to be successful and accomplish everything that I have dreamed of accomplishing. I want to help make the team successful and use my gifts that God gave me to be successful. Any team that drafts me is going to get a relentless worker who is going to a team player. I want to improve myself and my team.